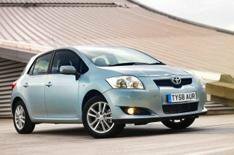 Greenest Toyota Auris goes on sale | What Car? Toyota has unveiled a fuel-efficient version of its Auris small family car with a new engine, gearbox and stop-start technology. The car is powered by a lightweight 100bhp 1.33-litre engine, that's linked to a new six-speed gearbox and the stop-start technology that cuts the engine when the car is at a standstill. The new model averages 48.7mpg and emits 135g/km of carbon dioxide. That is an average cut of 19% in fuel consumption and a reduction of 17% in CO2 emissions compared with the 1.4-litre unit that it replaces. As a result it falls into VED road tax band C instead of D, potentially saving owners 60 next year and 65 for the subsequent two years. Prices start from 12,705 and are 200 more than the equivalent outgoing 1.4-litre model across the range. All future Toyotas will be built along the same principles of reducing emissions and fuel consumption without affecting compromising driving pleasure, a scheme the company is calling Toyota Optimal Drive. As a result, it has vowed not to sell eco variants of its existing cars, as it says the design, engineering and equipment tweaks needed to reduce emissions compromise the cars' comfort and driving pleasure.